Pancakes for dessert!! 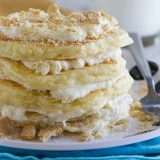 These fluffy Cheesecake Pancakes are topped with a cream cheese frosting and graham cracker crumbs for a fun and delicious treat. Heat a large skillet or a griddle over medium heat. In a large bowl, mix together the flour, pudding mix, sugar, baking powder, baking soda and salt. In another bowl, mix together the buttermilk, egg and oil. Stir the wet ingredients into the dry ingredients and stir just until combined (lumps will still remain). Spray the skillet or griddle with nonstick cooking spray. Place 1/4 cup of the batter into the pan. Use a spoon or wet fingers to spread the batter into a circle – the batter is quite thick and will not spread on it’s own. Cook for 3 minutes per side, or until browned and cooked through. Repeat with the remaining batter. While the pancakes are cooking, make the frosting: in a medium bowl, beat the butter and cream cheese until light and fluffy. Add the powdered sugar, pudding mix and milk and continue to beat until combined. To serve, spread the frosting on the pancakes. Top with crumbled graham cracker.